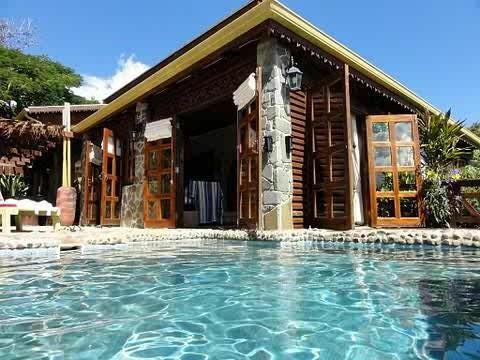 Villa Zatarra Saint Lucia represents a Caribbean Vacation experience and a short term villa rental stay at it's best! Villa Zatarra is Nestled in the heart of Cap Estate, one of the more affluent areas of St Lucia exists a property spanning across ¾ acre of lush landscaping and a cool Sea breeze and 18 hole golf course. Villa Zatarra was Designed and built by celebrity saxophonist, Rob Zii Taylor and his wife, Veron ,their labor of love and unique style and design is now complete. Villa Zatarra is a 2 bedroom 2 bathroom sanctuary that quietly boasts a rustic island feel with hints of Indonesian accents throughout ,from hand carved teakwood pieces to the sounds of the waterfall, cascading into the intimate pool, you will find this St lucian retreat. Original paintings, driftwood, stone floors, wooden decks, waterfall and a beautiful pool with color changing LED lights, herb garden, hammocks Ocean views are just some of the eye pleasing features of this property. Villa Zatarra has no shortages of creature comforts . Modern, well equipped kitchen, TV’s in all bedrooms and a Smart TV in the living room. Free Wifi throughout, AC units in all bedrooms . Walk in showers, large bath in master bedroom. And for outside cooking there is a BBQ grill in place. The property is just minutes away from numerous beaches to enjoy as well as the 18 hole golf course. Shops, Restaurants and nightlife are located mostly in Rodney Bay which is just a 5-10 minute drive and easy to find once the guests have done the short orientation tour the morning after they arrive which has always been regarded as a great way to get started and welcomed by all. What makes Villa Zatarra popular with guests who have stayed here? So, where does the name Villa Zatarra come from? Well, you will have to come stay here for the owner to explain that one himself to you!! Apart from experiencing the peaceful serenity of Villa Zatarra, you'll also be able to catch Rob Zii Taylor at one of his performances like this sunset one. See you here in St.Lucia! Check out Rob at one or all of his live sax on the beach gigs!! Cap Estate is the most popular place in St.lucia for a vacation property, with breathtaking Atlantic Sea views/ amazing sunrises and is located a stone throw away from all the restaurants, shopping and beaches in Rodney Bay and the Rodney Bay Marina, but is ideally located in a peaceful quiet spot. Can En Bas Beach, Pigeon Island Beach and The Cliff are all also only a 5 minute drive away, as is the St. Lucia Golf Course. Villa Zatarra is fenced and secured with a set of 8 ft double door gates. Villa Zatarra has converters,transformers and sockets throughout the villa, to accommodate USA and UK appliances. Guests have the option of choosing a Honey Moon stay for 2 persons or 4 persons ,. Villa Zatarra is ideally located in the affluent popular area of Cap Estate which is perfect for vacation rentals. With Golf Course and fantastic Sea views, and magical sunrises , and Open alfresco BBQ 's together with the welcoming soothing sounds of the cascading water falls into the pool . Villa Zatarra operates as a honey moon villa for 2 persons or as an accommodation for 4 persons The choice is all yours. Villa Zatarra is ideal for honey mooners, couples and families!!!!! Email us to create your ideal stay. Fantastic Atlantic Sea views from both levels inside and outside of the villa. Bed Linens and towels are provided and changed when necessary. House Keeping can take care of any laundry needs upon request. House Keeping can take care of any laundry needs on request. Provided at NO EXTRA COST through the villa. Lots of towels and Beach ones too!! Villa Zatarra has a cabinet that is used only to house the multiple book selections. Feel free to leave a book or take book if you have not finished reading your book during your holiday. Lots of Board games are available inside the villa. A selection of CD's are available in the villa. Owner Rob Zii Taylor is a local Saxophone celebrity on the island and keeps the music selection up to date. The Deck is located near the BBQ Grill, which makes it ideal for guests to cook and eat in the great outdoors! whilst enjoying the moonlight or starry sky. Villa Zatarra has its own secluded private pool that is available for guests. House Keeping can take care of any laundry needs on request. Private Gated Driveway, Parking for RV/Boat/Trailer, TV: Up to 50 channels, a selection of CDs are available in the villa, A local cellphone is provided to make calls to restaurants/tours/etc, The property is completely fenced and gated and an alarm system is installed creating privacy and security to be comfortable with, A list of food items/groceries can be purchased and stocked in villa upon arrival of the guests. Car hire can be provided and delivered directly to the property. Baby sitting service is available. Handicapped Accessible (may have limitations): The second bedroom/bathroom is downstairs. Great view and spacious villa. Robert was very gracious and helpful. We thoroughly enjoyed our stay at Villa is Zatterra. Our time by the pool and in the hammock on the balcony where we spent enjoying this lovely weather was perfect. It was great that they have games to play when the weathers not so perfect or in the evening if you don’t want to watch TV. They really have all the amenities of home here. We did a private tour through Stanis taxi service and we couldn’t say better things about it to people. Thank you for sharing your home! Most chilled out holiday we’ve ever had!! We have just spent a week in this wonderful villa on the beautiful island of St Lucia. I have never felt so unhappy to go home before. Normally I look forward to getting into my own bed but not this time. The bed in the master suite was massive and so comfortable. I now feel I NEED that walk in wardrobe and huge en suite bathroom. We chose this villa because it looked very Caribbean and homely and that’s just what it was. We went to celebrate our daughters 21st birthday and she loved it. Neither her or her sister wanted to leave. We spent most of our mornings by the pool and our afternoons at the beach then out for dinner at night. The house is so close to everything but secluded and quiet. We were picked up from the airport by Stanis who has the biggest smile and kindest nature. He also took us on a land and sea tour which we all agreed was the highlight of our holiday. We saw the Piton mountains, waterfalls, the volcano, banana plantation, mud bathes, botanical garden and had lunch at a beautiful resort. Then a cruise on a catamaran with snorkelling and lots of rum punch and dancing. It was such a fab day, if you want to see all the famous sites on the island then choose this trip as you see everything. We spent a day at Pigeon Island which is amazing. The beach and sea are so special and if you can climb to the top then you must as the views are to die for. We saw Rob playing sax one night and enjoyed his performance whilst having dinner, he is such a cool person. I could have listened to his stories and experiences forever. We especially liked his dog Sheba, she made our week as we felt guilty for leaving ours behind. So if you want to get away from everyday life at home and really chill out, I highly recommend this house and this island. It’s a memory made which we will cherish forever. **BOOK THIS PLACE** It is more breathtaking than the photos. Where do I start? When we first arrived, Robert had arranged transportation for us and our driver was there diligently waiting. The ride was entertaining as the driver was very nice and informative about our commute. We were approximately 1.5hrs away from the villa because it's on the northern part of the island. We made a stop along the way to an amazing place that makes homemade bread which the driver said was the best on the island. Let me tell you it did not disappoint! When we arrived at the villa, words cannot explain how beautiful this place was. The pictures do not show all the rustic charm and attention to detail this place held. The instructions for the wifi were on the counter and I was able to immediately connect and reach out to Robert via Whatsapp to let him know we'd arrrived. We talked the first day and personally met him the 2nd day. He greeted me with this great big smile and was just as nice and charming as this amazing place. Robert gave us all the information we needed for the island tours, beaches and hot places to visit. Anything that we needed, Robert was quick to respond. Such a gracious host! Nancy the housekeeper and Kiran the groundskeeper were also very nice. Kiran even cut down a coconut from the trees on the property for us. There were only two minor setbacks. I would recommend adding a little more lighting in the common area at night and the other was that our listing included car but due to uncontrollable circumstances, it was not available. Robert provided us with the owner of the transportation company's information and we ended up renting a vehicle. It was an unexpected expense but it was minor in comparison to everything else. Overall, the lush landscaping, the craftsmanship, the airiness of the house, the close proximity to the beach, the host..all made it a perfect place to vacation and I was so happy we chose this place. We truly loved this place and would definitely rent again from Robert. We didn't want the vacation to end. Thank you Robert for your amazing hospitality. Absolutely amazing from start to finish. Rob and Veron was very welcoming and helped with everything. Villa was beautiful,spacious, and clean. Great location close to beaches and markets and I overall had an amazing time! Villa Zatarra is well located to take advantage of all the beautiful attractions the North of the island has to offer. A relaxing 10 min walk will bring you to an east coast beach, Cas en Bas. A vast stretch of beach great for collecting driftwood and watching the kite surfers or just having a late afternoon dip. If Golf is your hobby, then the Cap Estate Golf and Country club is just minutes from the villa. All the best restaurants, bars and nightlife in Rodney Bay are between 5-10 minutes drive and other great beaches from Le Sport to Pigeon Point are all a nice 15 min stroll away. Housekeeping is provided Monday to Friday and laundry service is available on request. Golf: Private Golf Lessons can be arranged with a professional golf coach, who regularly tours and coaches in the US.